What’s Behind the Eritrea-Ethiopia Thawing Relations? Addis Ababa (GPA) – On June 5th Ethiopia announced a monumental reform on behalf of its new Prime Minister, Abiy Ahmed. The nation would accept and implement the 2000 Algiers Agreement that ended the Eritrean–Ethiopian War (1998-2000). It also announced a new support for a 2002 ruling by the UN-backed Eritrea-Ethiopia Boundary Commission (EEBC), which bestowed several contested territories, including the town of Badme, to Eritrea. For the last sixteen years, Ethiopia has ignored the ruling and kept troops stationed in these disputed territories. The reforms are seen as a leap towards normalized relations between the two rival countries, with wide support from the citizenry of each nation. Though the Irob peoples, who’ve lived under Ethiopian rule have found themselves arbitrarily split apart by the implementation of the EEBC ruling, and have organized against the division of their community between the two nations. After the war ended in a stalemate border dispute, Isaias Afwerki (the first and only Eritrean president), militarized the nation in the name of self-defense from Ethiopian occupation. His regime grew increasingly repressive and authoritarian with forced conscription for all citizens. Though Isaias Afwerki has consistently shifted blame on his nation’s human rights abuses, citing Ethiopia as a looming threat to the nation. An end of aggression between with Ethiopia could be problematic for Isaias Afwerk if he does not loosen his grip on the population, as an end to hostilities will leave the state’s repression with little ground to stand on. Yet, by the end of June, Eritrea sent a peace delegation to Addis Ababa for “constructive engagement with Ethiopia.” The trip effectively ended Eritrea’s 18-year refusal to dialogues with what they saw as an occupying nation on Eritrean land. On July 8th, Abiy Ahmed and Isaias Afwerki finally met in Asmara. Ethiopia stood by their announced reforms and a “Joint Declaration of Peace and Friendship,” was signed, effectively ending a state of war between the two countries. Why now, what made the warming of relations possible? Abiy Ahmed swept into office in April amongst a landslide of revolt. Hundreds of thousands took to the streets to denounce Ethiopia’s ruling party: the Tigrayan People’s Liberation Front (TPLF). 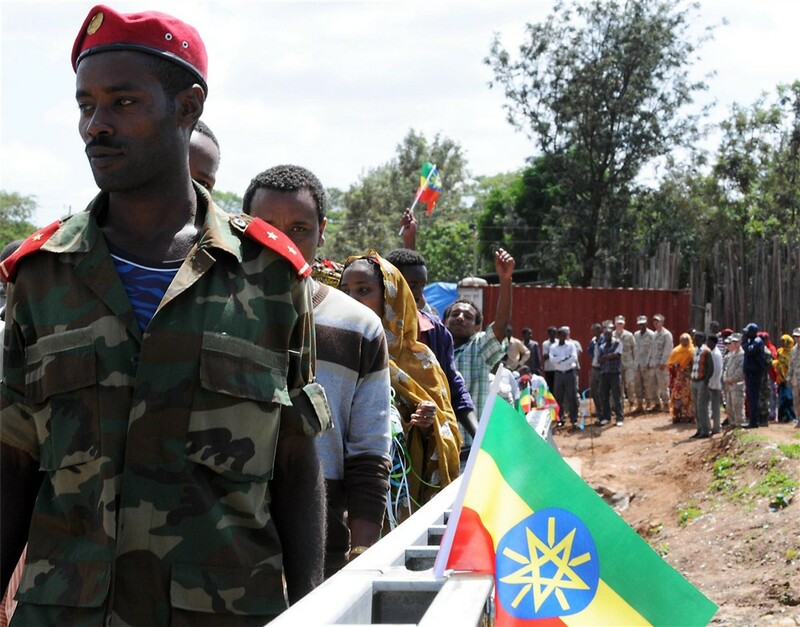 Though a small faction of the Ethiopian People’s Revolutionary Democratic Front (EPRD), nation’s ruling political coalition, the TPLF has held unlimited power in Ethiopia for two decades. With the election of Abiy Ahmed as prime minister his party, the Oromo Peoples’ Democratic Organization (OPDO) has shifted power out of the hands of the old guard. Eritrea and the new Ethiopian leadership are so eager to cooperate with one another because of their common enemy: the TPLF. Eritrea has long viewed the TPLF as agents of their oppression. With the ousting of the TPLF the EPRD can calm the Ethiopian population through their reforms, while the Eritrean government can finally claim their occupied land. Since signing of the Declaration of Peace and Friendship earlier this month, the rapid thawing of relations is becoming increasingly obvious. Flights between the two nations have already resumed and on July 16th, Eritrea reopened their embassy in Ethiopia. Though Ethiopia also sees the thaw as a means to consolidate regional power. The government is trying to increase regional transport infrastructure. Ethiopia is looking to decrease its dependence on Djibouti’s port and acquire access to the sea in Sudan, Somalia, Kenya, as well as Eritrea. Ethiopia is a landlocked country so access to the Red Sea is crucial. With the Grand Ethiopian Renaissance Dam near completion, Ethiopia stands to control a large portion of the water flowing through the Nile River. The dam will likely force Egypt into staying in the good graces of Ethiopia if they want access to the water they desperately need. Sudan is also expected to strengthen their ties with Ethiopia, as they intend to purchase electricity generated by the dam. Meanwhile, it appears that Saudi Arabia and the UAE acted as mediators in bringing Eritrea and Ethiopia closer together. The Gulf states are likely grooming the African nations away from Iran and Qatar with financial backing. This spring Abiy Ahmed’s first international trip as prime minister was to Saudi Arabia, while soon after Abu Dhabi hosted Isaias Afwerki. The United Arab Emirates set up their first overseas military base at Eritrea’s Assab Port in 2015. Dubbed “Little Sparta,” the UAE has since established or is underway to establish a series of bases throughout the Horn of Africa. Saudi Arabia, on the other hand, has no formal foreign military presence anywhere. As Ethiopia continues with privatization plans, Addis Ababa will likely look to regional economic powerhouses for trade and investment. Eritrea, however, already relies on the Kingdom of Saudi Arabia as one of their main trading partners. It’s unclear how the regional dynamic will shift just yet. It is clear, however that regular Ethiopians and Eritreans couldn’t be happier that tensions have thawed for at least the time being. Originally published, July 23rd, 2018 at Geopolitics Alert.